Breaded zucchini chips for vegans (and vegan kids!). Many breaded and fried or oven-fried zucchini chips recipes call for eggs, milk or other ingredients that aren't vegan. But you don't actually need the eggs in order to make a tasty breaded zucchini chip snack. Here's an easy way to make breaded and baked zucchini chips without milk or eggs - completely vegan. In this recipe, you can use regular breadcrumbs, or, if you prefer something a little bit lighter, try using panko breadcrumbs instead. 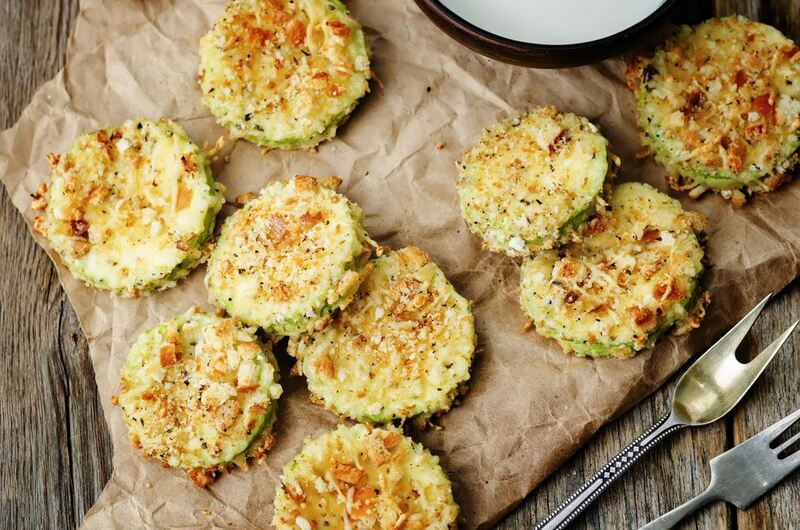 Note that these breaded zucchini chips can be either baked in the oven or lightly pan-fried in a bit of oil - it's up to you and how healthy you want them to be. Another quick note - it's good to use seasoned salt in recipes like this one, which need a little extra savory flavor boost. However, some brands of seasoned salt contain MSG (monosodium glutamate), which is best to avoid. If that's something which is important to you to, check for a brand of seasoned salt which doesn't have it, or, swap out the seasoning salt for another of your favorite spice blends. We like Mrs. Dash Original and Cajun-style seasoning blends. Preheat oven to 475 degrees and lightly spray a baking sheet with olive oil or non-stick cooking spray. In a large bowl, combine bread crumbs, Italian seasoning, garlic powder, onion powder and seasoned salt. Place the soymilk in a separate small bowl. Gently dip each slice of zucchini into the soy milk, then gently coat each slice well with the seasoned breadcrumb mix. Arrange the breaded zucchini slices on a single layer on baking tray, then bake for 5-10 minutes, or until lightly crisped. Turn zucchini chips over, then bake for another 5 minutes. These breaded and oven-baked zucchini chips are great on their own, but if you're cooking for kids, you might want to serve them up with a bit of ranch dressing. Here's a great homemade vegan ranch dressing to try. If you prefer, you can also pan-fry these little zucchini chips in a bit of oil over medium-high heat. You'll need about 4-5 minutes on each side to get them nicely browned and crisped. If you like these breaded and baked vegan zucchini chips, you might also like these breaded tofu fingers, which are also perfect for kids. Need another healthy way to serve up a bumper crop of zucchini? Try Dr. Esselstyn's oil-free "fried" zucchini, or, try one of our favorites: a vegetarian black bean and zucchini tortilla soup recipe -- yum!